Acute kidney injury is increasingly prevalent,1 but unlike myocardial infarction, AKI often has no signs or symptoms, making risk assessment via traditional methods difficult.2 The NephroCheck Test, designed to help you evaluate critically ill patients’ risk of acute kidney injury, is a breakthrough in renal risk assessment. The NephroCheck Test was created for use alongside clinical evaluation of critically ill patients over 21. With results in just 20 minutes, the test is intended to assist the clinician in assessing the risk of moderate to severe acute kidney injury in the next 12 hours. 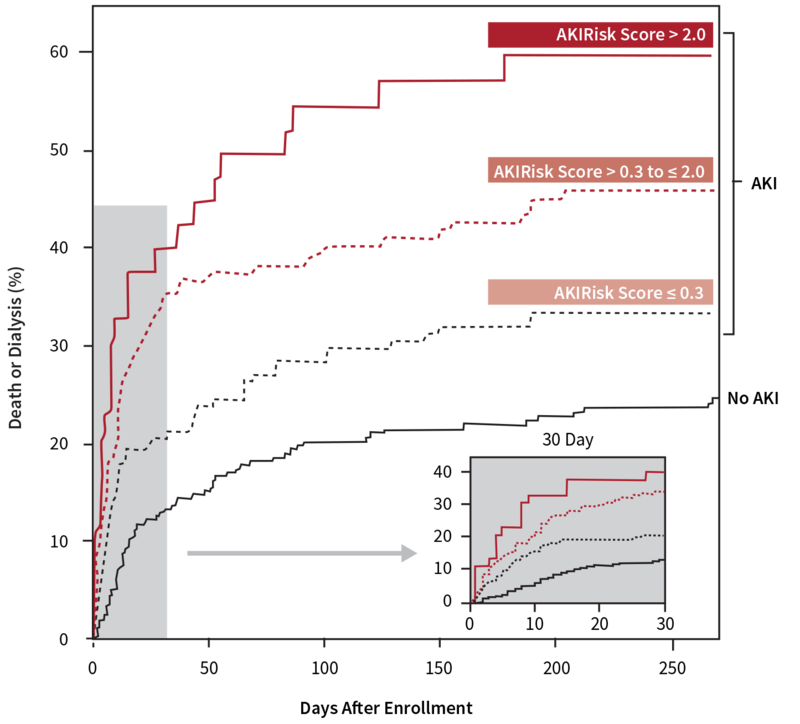 Identify which patients may be at increased risk of developing AKI, and those who are at lower risk of developing AKI. Stratify patients who have a high (> 0.3) or the highest (> 2.0) risk of developing moderate to severe AKI in the next 12 hours. The test results empower physicians to implement their preferred kidney-sparing strategies to potentially prevent permanent kidney damage or death. Why is early identification of AKI important? Dr. Peter McCullough discusses how early identification is fundamental for treating acute kidney injury. The NephroCheck Test can help inform certain adjustments to critical care management. This cutoff was selected to have high sensitivity for the primary end point and with the intent to be used in routine clinical practice to identify patients who are at high risk for AKI. A high cutoff was also selected to allow identification of patients who will develop AKI with high specificity. *Moderate to severe AKI in the next 12 hours. The NephroCheck Test remains a statistically significant predictor of death or dialysis after adjustment for disease severity (APACHE III) and serum creatinine. 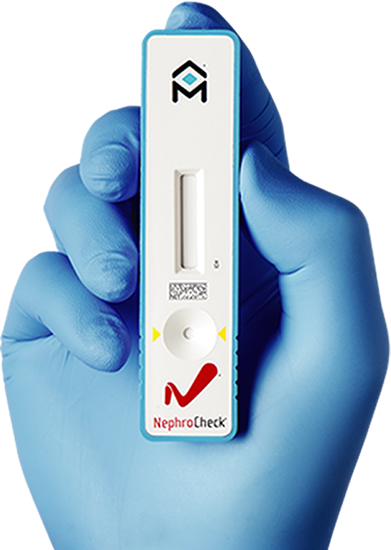 A recent review in Nephrology Dialysis Transplant8 addresses the use of the NephroCheck Test in a biomarker-guided patient management strategy based on KDIGO guidelines. 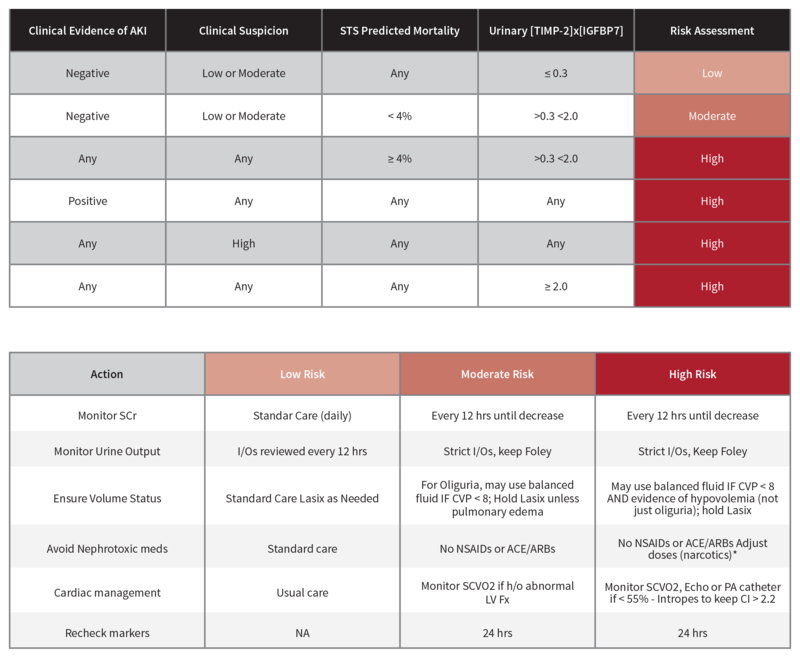 Proposed clinical application of risk assessment for patients immediately after cardiac surgery. STS, Society of Thoracic Surgery; I/O, input and output; SCr, serum creatinine; CVP, central venous pressure; NSAIDs, non-steroidal anti-inflammatory drugs; ACE, angiotensin converting enzyme inhibitor; SCVO2, central venous oxygen saturation; h/o, history of; LV Fx, left ventricular function; PA, pulmonary artery; CI, cardiac index. McCullough PA, Shaw AD, Haase M, et al. Diagnosis of acute kidney injury using functional and injury biomarkers: Workgroup statements from the Tenth Acute Dialysis Quality Initiative Consensus Conference. Contrib Nephrol. 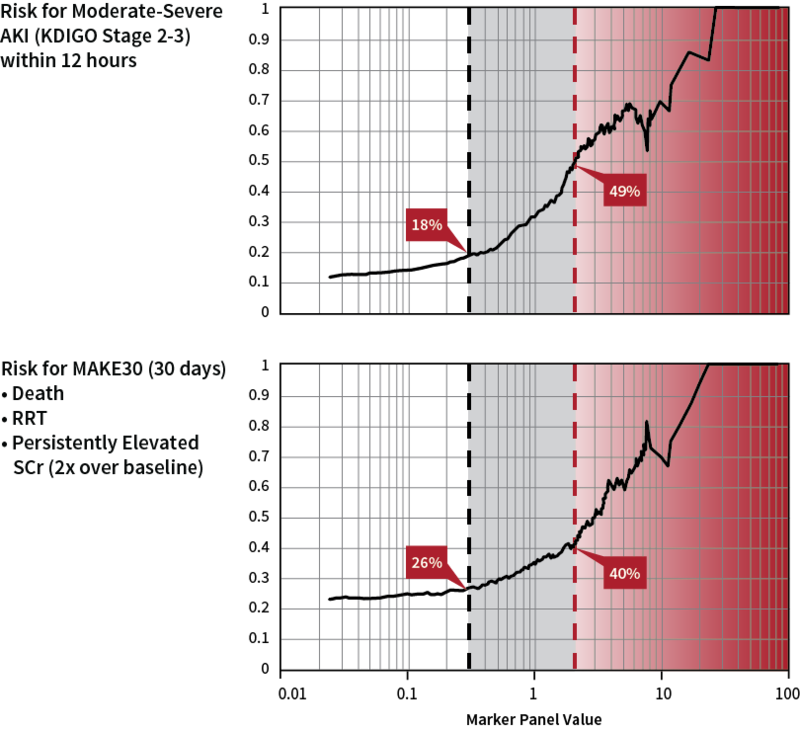 2013;182;13-29. Bihorac A, Chawla LS, Shaw AD, et al. Validation of cell-cycle arrest biomarkers for acute kidney injury using clinical adjudication. Am J Respir Crit Care Med. 2014;189(8):932-939. Hoste EA, McCullough PA, Kashani K, et al. Derivation and validation of cutoffs for clinical use of cell cycle arrest biomarkers. Nephrol Dial Transplant. 2014;29:2054-2061. Koyner JL, Shaw AD, Chawla LS, et al. Tissue Inhibitor Metalloproteinase-2 (TIMP-2)*IGF-Binding Protein-7 (IGFBP7) Levels Are Associated with Adverse Long-Term Outcomes in Patients with AKI. JASN. 2014. Kellum JA, Chawla LS. Cell-cycle arrest and acute kidney injury: the light and the dark Sides. Nephrol Dial Transplant. 2015;0:1-7.